Looks like The Hustle Is On again shortly for Soul Immigrants then. Eh – what? 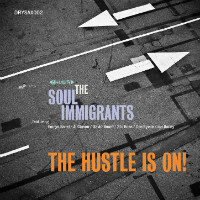 Immigrants on the hustle?! Bloody foreigners – this island will sink if any more…Whoahh there! Calm down UKIPpers – this is Soul Immigrants – the UK funk band! And the only hustle they’re on is a musical one. They’re not after your money (the bankers had that ages ago) or at least, these guys are only after the price of the new album. And the LP is the kind of – er – hustle where you can expect eleven loose seventies-ish funk grooves which veer between the Jamiroquai-ish (Yard Of Hard) and the Incognito-ish (Shoots Lament) with occasional flashes of something a little more jazz-funky (Sunk Without The Funk) or something a little more JBs-like (Projects) here and there. Talking of the JBs – who should feature on no fewer than two tracks here but one Mr Fred Wesley! His is a legendary presence explained by the fact that guitarist/ vocalist Emrys Baird (who employs a Curtis-ish falsetto on most of the LP) – supported the JBs on a late 80s tour when he was in the Funk Ambassadors. Handy gig. Best cut is LP centrepiece Shoot Le Freak. 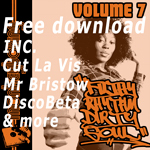 Check the making of The Hustle Is On vid below plus Fred Wesley-feaaturing LP cut Yard Of Hard.